The latest product from Feedback Sports is the new Pro Truing Stand that features a one arm design that allows unrestricted wheel access,can true up to 29 wheels without removing the tire, Precision single spring tip indicator for checking lateral and radial rim position, Disc brake rotor truing slot, Check dish by simply flipping the wheel, Stable base and bench mount adaptor included, 12mm and 15mm axle adaptors included, Easily portable; mounts to Feedback brand work stands. Max wheel diameter: 29 with tire. Base included. 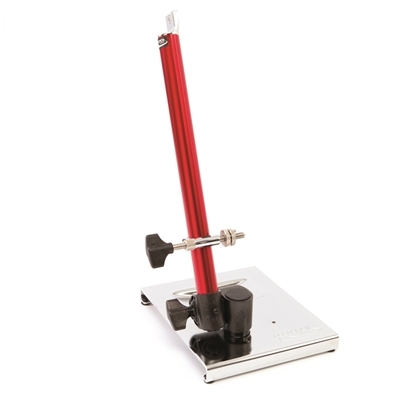 Footprint 10.25X 8.5 (265mm X 215mm) Base weight = 5.8lbs (2.6kg) 4 X 6 (101mm X 152mm) bench mount included Red anodized aluminum arm/ steel base, 3 year warranty from Feedback Sports.